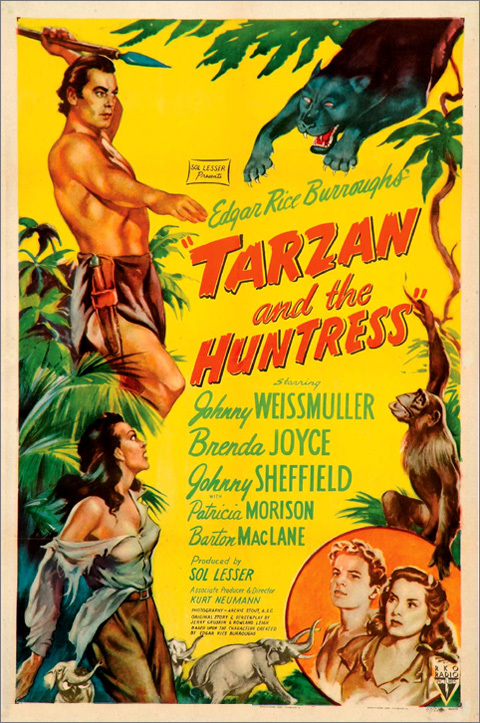  Following Tarzan and the Leopard Woman (1946) Weissmuller was finally given a chance to broaden his acting career but only managed to produce the mediocre Swamp Fire (1946), which is mostly memorable for combining two ex-Tarzans. It also featured Buster Crabbe (Tarzan the Fearless - 1933). Weissmuller resigned himself to doing what he did best and for what he was most loved for, got himself back into shape and went back to the loincloth. His next Tarzan picture was to be the best of the six that he made at RKO. It used the time-tested formula of greedy white hunters plundering the jungle and capturing animals for zoos, which allowed the use of abundant stock wildlife footage, a big hit with audiences at the time. 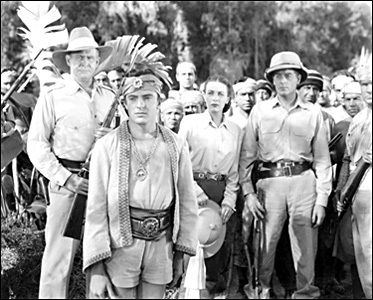 It was filmed at the usual RKO locales - the Arboretum for the jungle scenes and the RKO Encino Ranch for the city scenes - and proved to be a box office success. The high returns on the picture only increased Weissmuller's discontent over his inability to claim a cut of the overall receipts and he would retire from the role after his film. (Essoe, Fury & St Andrews) Read the full story at Geoff St Andrews' Tarzan the Huntress page.  A group of animal trappers, led by the attractive Tanya Rawlins (second from right in photo), visit the jungles of Teronga and attempt to persuade King Farrod to rescind the quotas he has placed on them. The kind old king limits the visitors to catching only two of each species so Farrod's corrupt nephew, Prince Ozira, conspires with them and offers to lift the quota in return for a bounty. Ozira arranges for an "accident" that results in the death of the Farrod and leaves the king's son, Prince Suli (second from left in photo), unconscious, believed to be dead. When the trappers begin catching animals Tarzan frustrates them by calling all of the animals to his protected side of the river. Paul Weir, Tanya's surly head hunter (far left in photo), ignores Tarzan's threats and crosses the river with his men to begin trapping. 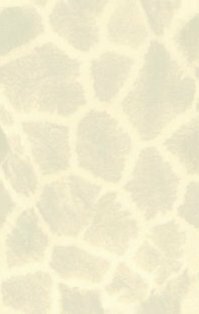 Tarzan and Boy discover the injured prince and decide it is time to tell the people of Terongo the truth about their king's death. Tarzan tracks and kills three of the hunters and calls his elephants to trample the main camp. Weir is torn apart when he falls into a lion pit but Tanya manages to escape in her plane. Prince Suli takes his rightful place on the throne and the kingdom is restored to peace.